Presented by Nickelodeon, VStar Entertainment Group and TEG Life Like Touring, in PAW Patrol Live! “The Great Pirate Adventure,” Mayor Goodway is getting everything shipshape for a big Pirate Day celebration in Adventure Bay. When Cap’n Turbot falls into a dark and mysterious cavern, it’s PAW Patrol to the rescue! Chase, Marshall, Rubble, Skye, Rocky and Zuma save Cap’n Turbot and discover a secret pirate treasure map that leads them on an epic adventure. Over land and on the high seas, the pups set out to find the treasure for Mayor Goodway so the celebration can go on. Things get ruff when Mayor Humdinger wants to find the treasure first for Foggy Bottom. The pups need all paws on deck for this pirate adventure, including help from the newest pup who’s all ears…Tracker! Using their heroic rescue skills, problem solving and teamwork, the pups set sail to save the day. No job is too big, no pirate pup is too small! Similar to PAW Patrol Live! “Race to the Rescue,” which continues to tour the world in 2018, this new show, PAW Patrol Live! 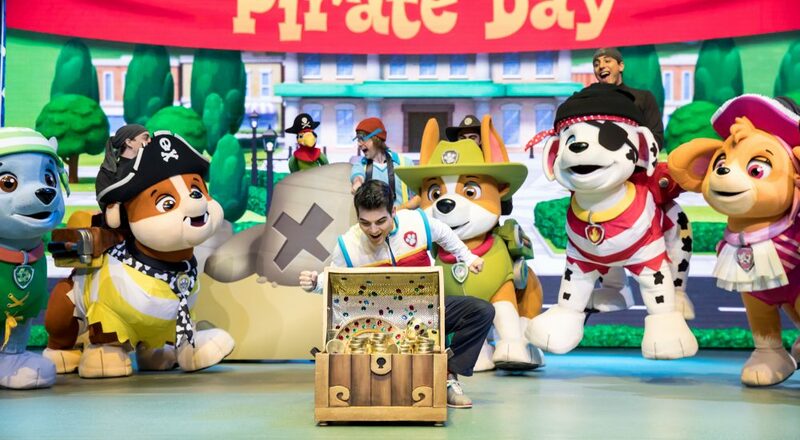 “The Great Pirate Adventure,” includes two acts and an intermission, and incorporates an innovative costume approach to help bring the pups to life on stage as well as their vehicles and packs during the adventure. Fans can visit pawpatrollive.com.au for PAW Patrol Live! “The Great Pirate Adventure” and PAW Patrol Live! “Race to the Rescue” tour schedules, ticket sale information and PAW Patrol Live! Tail Mail, where they can sign up to be among the first to receive tour updates and exclusive ticket pre-sale information for all future tours. Thank you, you have been added to the subscribers list. Please check your mailbox for the confirmation email.